More and more Africans are using mobile technologies to access social media tools on the Internet. In the mid-1990s, as the use of mobile phones started its rapid spread in much of the developed world, few thought of Africa as a potential market. Now, with more than 400 million subscribers, its market is larger than North America's. Africa took the lead in the global shift from fixed to mobile telephones, notes a report by the UN International Telecommunications Union. * Rarely has anyone adopted mobile phones faster and with greater innovation (see A bank in every African pocket?, Better health at the click of a button). A similar story now seems again to be unfolding. Africans are coupling their already extensive use of cell phones with a more recent and massive interest in social media — Internet-based tools and platforms that allow people to interact with each other much more than in the past. In the process, Africans are leading what may be the next global trend: a major shift to mobile Internet use, with social media as its main drivers. According to Mary Meeker, an influential Internet analyst, mobile Internet and social media are the fastest-growing areas of the technology industry worldwide, and she predicts that mobile Internet use will soon overtake fixed Internet use. Studies suggest that when Africans go online (predominantly with their mobile phones) they spend much of their time on social media platforms (Facebook, Twitter, YouTube and so on). Sending and reading e-mails, reading news and posting research queries have become less important activities for Africans. In recent months Facebook — the major social media platform worldwide and currently the most visited website in most of Africa — has seen massive growth on the continent. The number of African Facebook users now stands at over 17 million, up from 10 million in 2009. More than 15 per cent of people online in Africa are currently using the platform, compared to 11 per cent in Asia. Two other social networking websites, Twitter and YouTube, rank among the most visited websites in most African countries. Along with regular citizens, African stars, thinkers, political leaders and companies have rapidly joined the global conversation. The Facebook fan base of Côte d'Ivoire's football star and UN goodwill ambassador Didier Drogba is more than 1 million people. Zambian best-selling author and economist Dambisa Moyo has more than 26,000 followers on Twitter. Media organizations in South Africa and companies such as Kenya Airways are using various social media platforms to interact better with customers and readers. During recent elections in Côte d'Ivoire candidates did not only tour cities and villages; they also moved the contest online, feverishly posting campaign updates on Twitter and Facebook. High costs and poor connections still limit Africans' use of computers to gain access to the Internet. Africa's upward trend in the use of social media is even more striking given the low number of Africans connected to the Internet and the many hurdles Africans face in trying to go online. Africa's Internet users (more than 100 million at the end of 2010) represent just a small percentage of the 2 billion people online around the world. In the US alone, more than 220 million people use the Internet. Within Africa, one person out of every 10 is estimated to be an Internet user (up from one in 5,000 back in 1998), making the continent the region in the world with the lowest penetration rate. Among the many reasons for this poor showing are the scarcity and prohibitive costs of broadband connections (the fastest means of accessing the Internet), and the limited number of personal computers in use. But these challenges simultaneously contribute to Africa's impressive growth rate in the use of mobile Internet, which in recent years has been the highest in the world. "Triple-digit growth rates are routine across the continent," notes Jon von Tetzchner, co-founder of Opera, the world's most popular Internet browser for mobile phones. "The widespread availability of mobile phones means that the mobile Web can reach tens of millions more than the wired Web." Mr. Tetzchner believes that like mobile phones, whose use has grown rapidly in Africa in recent years, the "mobile Web is beginning to reshape the economic, political and social development of the continent." Erik Hersman, a prominent African social media blogger and entrepreneur who helped drive development of the ground-breaking platform Ushahidi (see Young Africans put technology to new uses), is equally enthusiastic. In an e-mail to Africa Renewal he notes that "with mobile phone penetration already high across the continent, and as we get to critical mass with Internet usage in some of Africa's leading countries (Kenya, South Africa, Ghana, Nigeria, Egypt) … a seismic shift will happen with services, products and information." The sense that the future holds more promise is inducing major companies to show special interest in Africa's expanding pool of Internet users. Facebook, after launching versions in some of the major African languages (including Swahili, Hausa and Zulu) in May, has announced it will offer free access to its platform to mobile phone users in various countries around the world, including many in Africa. In October Google started testing a new service for Swahili speakers in East and Central Africa. Tentatively called Baraza ("meeting place" in Swahili), it will allow people to interact and share knowledge by asking and answering questions, many of them of only very local or regional interest. 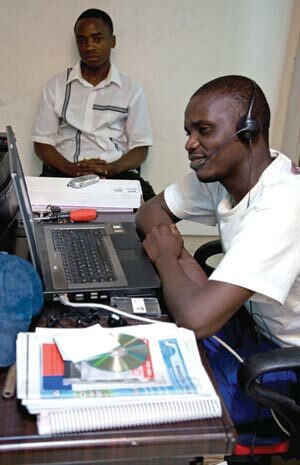 Africans are also getting ready to benefit from the fast-growing mobile Internet sector. 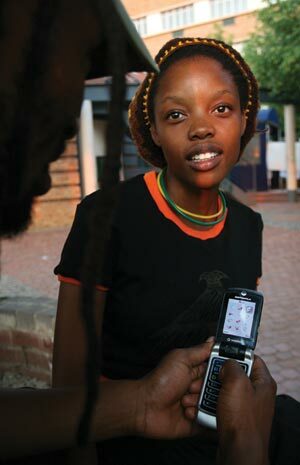 In South Africa, MXit, a free instant messaging application with an estimated 7 million users, is the most popular local social networking platform. From Abidjan and Accra to Lusaka and Nairobi, African programmers are designing, testing and launching new homegrown platforms and tools to keep the African online conversation going. * Measuring the Information Society: The ICT Development Index, 2009. Can ‘peace radio’ survive in peacetime?